Everyone has a favorite communication or higher education theory. 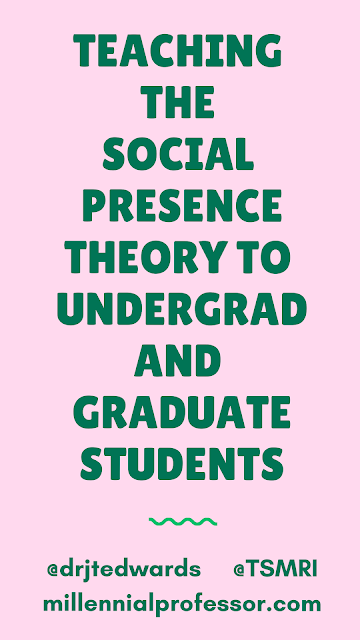 My favorite theory is the Social Presence Theory (especially for electronic communication. I apply this theory to higher education and communication research. I also teach this theory to our students (graduate and undergraduate students) each semester. Some of my classes are online and previously this presented a problem for the students who are engaged in the research process. Now, the students have an opportunity to learn about the theory through a new, free webinar software...no, not Zoom - yes it's Facebook Live! Usually I "go live" during our weekly chats for class! So, I use Facebook Live to teach concepts when students have questions. This has been VERY convenient because students do not have to log on to the software system (Zoom) when they need to access the video. In fact, you do not have to log on to access the video and you can embed it (like the one below) on your Course Management System (we use Blackboard). Here's a brief description of the Social Presence Theory for our students (and the others who viewed the video).